Static Control - Beacon Distributors Inc.
equipment. Its construction satisfies all machine construction requirements and it has proven its value time and time again in the removal of electrostatic charges during roll, sheet and web (continuous product) processing. Product-interfering surface charges can be removed reliably and effectively - even at high operating speeds - with a HAUG ionizing unit. The HAUG Static Eliminator Bar (Ionization Bar) type EI-VS reliably removes electrostatic charges and its performance, when compared to the standard version, is considerably enhanced. The Static Eliminator Bar type EI-VS has all the features which characterize HAUG Ionization Bars, especially the reliable and removable contact system, the screened high voltage cable, the absolute contact safety and special electrodes made from special steel. The Haug Ionization Rings have a two part ring electrode which can be operated for a short period of time during machine setting up. 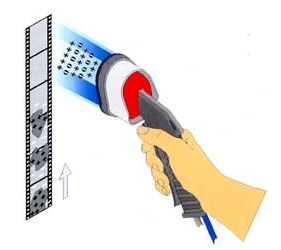 During production, for instance, this enables quick and uncomplicated changing of the film. Also, the minimal dimensions guarantee a wide field of application with the most diverse types of machines. Finally, the high voltage parts are encapsulated and absolutely safe to touch. Upon receiving the ionization ring, the simple instructions will make the experience even more satisfactory. As seen above, the one-point-ionizer is emitting positive and negative ions, this unit neutralizes reliably electrostatic spot charges. This ionizer is perfectly suited for mounting in places where there is little room. 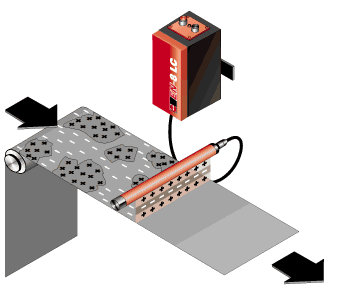 The plug of the electrode must simply be connected to the high-voltage transformer and the unit can be quickly set into operation without tools. 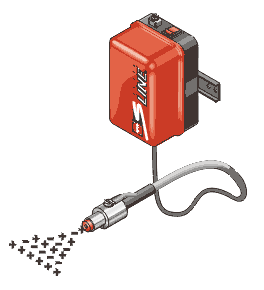 Ionizing Air Gun RI-LG "Light Gun"
The Ionizing Air Gun consists of few individual modules, each of which is exchangeable. 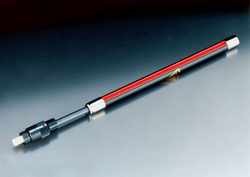 The high-voltage cable can be extended, shortened or exchanged. 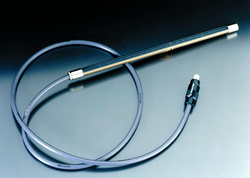 Another advantage to the Air Gun is it can be conveniently and efficiently used by left and right handers. These users also appreciate the remarkably little noise and low weight. Finally, the utilization of the intake air through bypass channels results in an extremely low air consumption. Thereby this technology also allows considerable cost savings. It is suitable for hazardous areas and can be accompanied by a HAUG power pack to provide the high-voltage necessary.